The new Jetpack Dashboard provides a quick overview of all Jetpack’s powerful features — sort by category, alphabetical order, or by newest additions to get right to the one you’re interested in. Verifying your site ownership with services like Google, Microsoft’s Bing, and Pinterest can be an experience in frustration. Jetpack 3.0 adds a Site Verification Tools module — just register with any of the available services (links are provided on the feature’s configuration page), drop in the provided key, and presto! Site ownership verified. Read more about it! There are many more minor enhancements and bug fixes with Jetpack 3.0. (Too many to list here!) For full details see the change log. As always, we’re continually striving to make the Jetpack experience more streamlined and enjoyable. We would love to hear what you think of the new user interface: what do you like? What would you love to see in the future? Leave us a comment below! This entry was posted in Releases and tagged release. Bookmark the permalink. Awesome! Thanks Jetpack team – the new settings page is exactly what I’ve needed. Cheers! Good news! Love the new (de)activation features. Thanks a bunch! 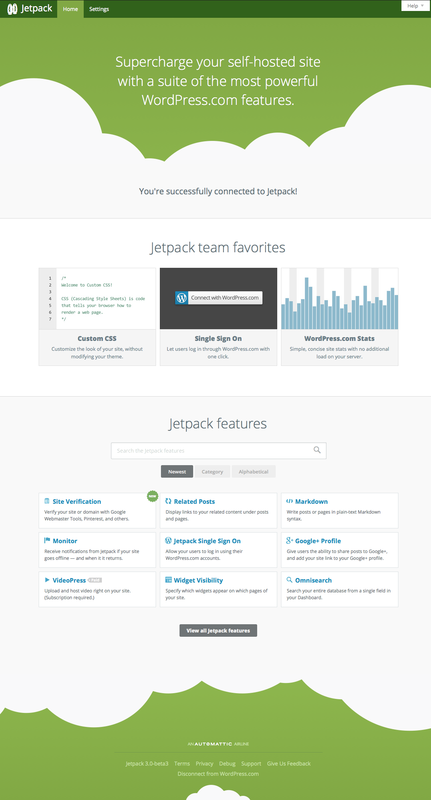 I love the ability Jetpack provide to enable even more awesomeness in self-hosted WordPress. How does one disable the login form from the SSO feature? The changelog says there’s a new ‘SSO option to turn off login form completely, to use WordPress.com login exclusively;’ I couldn’t find it anywhere. What do you mean by this? 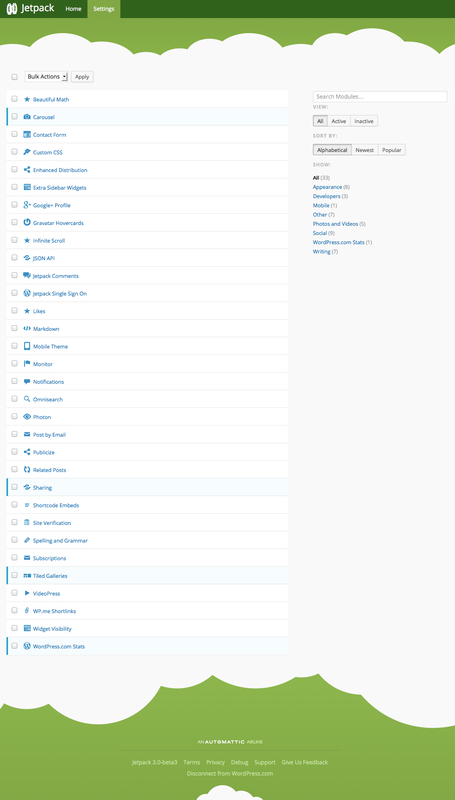 I still see the old login form and below that WordPress.com login. Hi, Thanks alot for this great upgrade. but – there are some important design issues related to the RTL display of the new jetpack pages. I would love to help out. Hi Dan. We would love for you to get involved. The first step is to head over to our Contribute page to learn how http://jetpack.me/contribute/. From there hop over to http://github.com/automattic/jetpack where you can contribute code updates, create/respond to support/feature requests, etc. Jetpack has received many negative assessments in the IT press. Advertising always touts what the offerer thinks are good selling points, avoiding the negative; in light of the dismal reputation, Jetpack should be directly addressing is claimed faults, especially w/r/t security. Jetpack has frequently been cited as an example of the problem with “open software” projects. How does the team respond to that? In addition, WordPress has been flagged as one of the next monster user ID hacks because its user data is generally insecure. What is happening there? Who is addressing this problem? Does that exposure extend to free standing (self-hosted) blogs? We don’t really avoid negative assessments, if anything I welcome them as opportunities to start conversations about how things can improve, or at the very least, coming to an understanding of each other’s points. I’m somewhat confused what you’re referring to as Jetpack’s security faults, especially those intrinsic to open software projects. When we find a security flaw, we address it thoroughly, promptly, and responsibly, and are rather proactive in notifying our users — going so far as to disconnect sites and potentially lose users, rather than risk their security being compromised. I see you also posted about this in the P2 theme support forums. Thank you! That will help our theme team, and they’ll be able to include this fix in a future P2 release. I’m a big Jetpack fan so thanks for your continued efforts. It’s pretty hard to figure out all of the modules now, however. We need a book or ebook that has a few pages on each module, including an example screenshot of what it adds and its most important settings. And one more thing: I’m using the Jetpack “subscribe” option to let readers get my updates via email and it’s working great, but I’m wondering if there’s any way I can add a few lines of introduction (ideally “raw html”) to the messages, or even arbitrary header and footer content. Possible? Since install the update this morning, I’ve noticed that the like button contents overlaps the entry-meta. While this may be a theme issue, I have tried numerous themes that have the same problem. But I would like to take this moment to say thank you for a great product. Could you send us an email with a few links to the pages where you experience the issue, so we can take a closer look? Could you send us an email with more details about the issue? This is such a bad layout, that I’m not sure who I’m replying to. In any case, unfortunately, I’ve had to take Jetpack offline until I sort out a connection problem that’s affecting my site. I like the mono-color of the recent Jetpack 3.0. 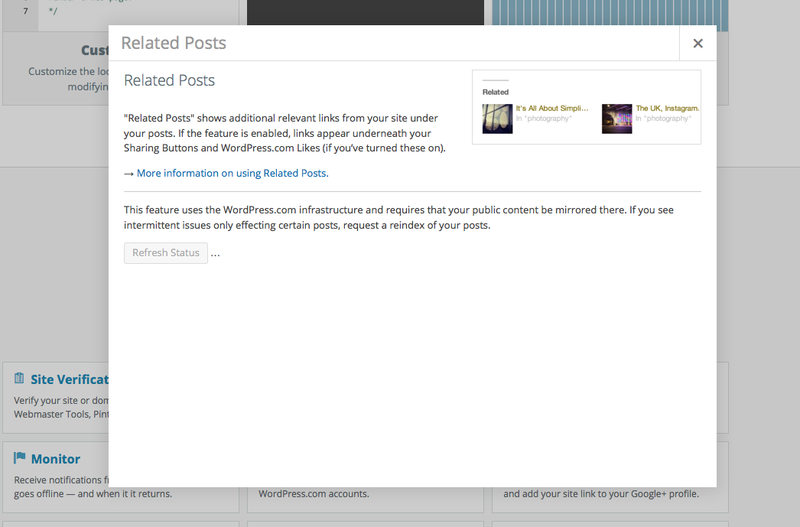 However, I noticed that with the current version, the “Like” button overlaps with my WP (Studiopress) “tag” area. As I’m not that tech savvy, any suggestion on how to fix this? Could you send us an email with more information about your site, so we can take a look? Thanks! Thank you for your response Jeremy. I have sent more information via contact-support. Since this is a very important SEO aspect – do you know when this will be fixed? An alt attribute is added to each image in your galleries if you’ve defined an alt value for the image, regardless of the gallery type. If that doesn’t work on your site, coud you make sure that you’re running the latest version of Jetpack? If that doesn’t help, could you send us an email with more details about your site, and links to galleries where you experience issues? Thanks Jeremy, my mistake. I entered text in the ‘caption’ field instead of the ‘alt’ field.